RetroFit Foam insulation is a private label name. RetroFit Foam was developed by a leading chemical company over 30 years ago and has been installed in more than 3 million new and existing residential constructions. In 1975, the manufacture of RetroFit Foam along with the help of a grant provided by the United States Department of Energy, under the Federal Non-Nuclear Energy Research and Development Act of 1974 (Public Law #93-577) expanded its research into thermal insulation foams. Recognizing the inherent shortcomings of polyurethane and urea formaldehyde foams, the D.O.E. chose Retrofit Foam as one of three products from a total of 7,000 to assist in further development. After three years of intense research and testing, Retrofit Foam greatly surpassed all of the D.O.E. expectations, and was made available for commerce. RetroFit Foam foam-in-place insulation is an innovative, ultra-light weight, Tripolymer foam insulation. RetroFit Foam insulation is a hybrid belonging to one of the oldest groups of synthetically produced thermosetting plastics. Phenolics, as they are referred to, were first synthesized in 1907 in the form of Bakelite. Today, phenolic plastics are well known for their durability, structural integrity, and extraordinary fire resistance. Phenolic plastics are used in electronics, automobiles, machine parts, fire-proof coatings, adhesives, tools, and thousands of other commercial and household items. When made into a foam insulation, phenolics are one of the safest and most efficient thermal and acoustical insulation products available. RetroFit Foam is a 60% closed-cell and 40% open-cell; semi-permeable foam that in one step provides a sealed, thermal envelope that simplifies retrofit practices. This foam insulation has been formulated with the environment in mind. It emits no VOCs or CFCs. It behaves much like a petroleum-based plastic foam, without any of the harmful environmental side effects. How can I purchase RetroFit Foam Insulation for my RI home or commercial building? Contact RetroFit Insulation, Inc., for expert advice and installation to meet all your insulation needs. We can install all types of insulation, and we are the exclusive distributor and installer of RetroFit Foam Insulation in Rhode Island. Can homeowners install RetroFit Foam themselves? No, because of the sophisticated equipment needed to install it properly, it takes certified, trained professionals like the insulation contractors at RetroFit Insulation, Inc., to install RetroFit Foam Insulation. RetroFit trains and certifies all its installers. How is RetroFit Foam installed? RetroFit Foam is a cold setting foam that is injected into a wall cavity through specially engineered metering equipment by the factory trained & certified contractors of RetroFit Insulation. 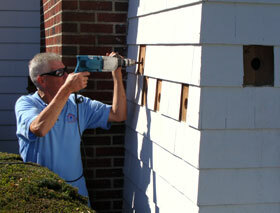 Usually, RetroFit Foam can be injected into the cavity through holes drilled from the outside of the house (see photo at right). It flows easily even into hard-to-reach cavities, filling them completely and hardening within 10 to 60 seconds after injection. Since it is a cold setting process, RetroFit Foam does not expand once injected into the wall cavity. What makes RetroFit Foam Insulation so effective? Because the foam insulation is applied as a liquid, RetroFit Foam is much more effective than traditional insulation products. RetroFit Foam conforms and fills each cavity as it is injected, creating a thermal envelope. RetroFit Foam forms a highly-efficient seal against air infiltration, the number one source of energy loss. This versatile insulation does not burn, settle, or disintegrate, and can be injected into any cavity. Because fiberglass or cellulose settle, they cannot seal around outlets or from stud to stud. In addition, if water or moisture invades the wall cavity, it can rob fiberglass and cellulose of their insulation value. By creating an air tight seal, RetroFit Foam can actually help rid a wall cavity of moisture problems by creating an air tight seal. In addition, RetroFit Foam is an inert substance which does not sustain mold growth. How RetroFit Foam control indoor air quality and comfort? RetroFit Foam provides a sealed thermal envelope. 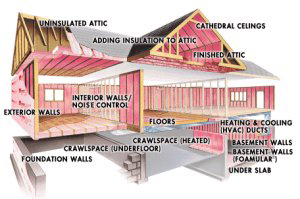 When applied, the insulation conforms and fills each cavity, crevasse and void. RetroFit Foam contributes to the overall comfort and health of the occupants of a home because there are no fibers or "clumps" of loose matter. By reducing air infiltration, the insulation also reduces dust and harmful, household mold and mildew. RetroFit Foam provides a healthier, draft-free, indoor environment with no harmful emissions that can cause allergic reactions. What is the R-value of RetroFit Foam per inch? RetroFit Foam has an R-value of 5.1 @ 72 degrees F per inch. It is the most efficient and affordable retrofit insulation money can buy! Does RetroFit Foam emit any toxic gasses or when subjected to high temperatures? No. When tested in accordance with the Federal Hazardous Substances Act, RetroFit Foam's by-products of combustion are significantly less toxic than those produced by the burning of white pine - a common wood used extensively in residential home construction. When tested for hazardous materials as listed in the EPA's Emergency Planning Community Right to Know Act under sections 311 & 312, test results show no toxic materials were detected, and combined aldehyde were again undetected at a level of 0.0007%. Is RetroFit Foam a urea formaldehyde product? No, RetroFit Foam is a unique non-urea formaldehyde based product, and a patented, proprietary product. Does RetroFit Foam contain any CFC? No, RetroFit Foam does not contain or use any chlorofluorocarbons in the manufacturing or foaming process. Is RetroFit Foam corrosive to metals? No. Unlike urea formaldehyde type foams that rely on strong mineral acids for setting and final curing, RetroFit Foam is polymerized by using synthetic cross linking compounds, producing a self neutralizing, non-corrosive foam product. How does RetroFit Foam save consumers money? The experts at RetroFit Insulation, Inc., will evaluate your new or existing in MA or RI home or commercial building's unique insulation needs and recommend the right products and installation that meet them. There are very few products that can achieve a 95% air seal in existing homes the way RetroFit Foam can. RetroFit Foam is cost-effective, reducing energy bills without the need for breaking into walls or other invasive renovations. The initial cost of installing insulation will be made up in savings on utility bills every month, summer and winter, year after year. Also, RetroFit Insulation is a participating contractor provider for MassSave, Energy Federation Inc, NSTAR, and National Grid which may provide qualifying homeowners with energy rebates and reduced financing options. Finally, insulation will increase the resale value of your home. Where can RetroFit Foam Insulation be used? RetroFit Foam can fill practically any closed vertical sections that require insulation. It is ideal for use in: CMU block cores, interior & exterior wood and steel stud wall systems, pre-cast concrete panels, pipe chases, filling property line voids between high-rise buildings, refrigeration units ... and more! RetroFit Foam is the best choice for new and existing residential home insulation. Is RetroFit Foam the only insulation process used by RetroFit Insulation, Inc.? No. Although RetroFit Foam is the best choice for insulating closed vertical sections in a variety of applications, it cannot be used in attics and ceilings. RetroFit Insulation uses high quality fiber glass or cellulose insulation in attics. Its formaldehyde-free properties make it cleaner to install and safer for the environment. Is RetroFit Foam fire resistant? Yes. Most architects and engineers agree that it requires more than one specific type of test to determine the fire characteristics of an insulation product. RetroFit Foam has been subjected to all applicable fire tests in redundancy in order to obtain the most accurate profile possible, and has performed in every case with astounding results. Can RetroFit Foam improve the fire ratings of a wall system? Yes! For over 34 years, the manufacturer of RetroFit Foam has engaged some of the most reputable independent laboratories in the country to test it. Using the ASTM E-119 procedure, fire tests were performed on many different standard and custom wall designs. Two identical walls were constructed - one empty, the other filled with RetroFit Foam. In every test, the RetroFit Foam filled wall showed an increase of fire ratings from 50 to 150 percent! RetroFit Foam does not melt or vaporize like other foam insulation materials when subjected to the ASTM E-119 testing. Because of its unparalleled fire resistance, RetroFit Foam has been approved by many state and local building and fire departments as the only foam-in-place insulation product to be used to increase fire ratings on existing non-compliant wall systems. How does RetroFit Foam control moisture movement and condensation? Most damaging moisture within a building envelope cavity is the result of warm moist inside air being exchanged with the cold dry air inside an insulation cavity. As the moisture in the air condenses, it forms dew within the insulation. Because RetroFit Foam is an air seal, this moisture movement and condensation does not occur. RetroFit Foam is ideal for use in climates where buildings are both heated and air conditioned because the situation is reversed in summer with moisture forming on the back of the interior vapor retarder. Does RetroFit Foam support bacteria or fungal growth? No. RetroFit Foam as an inert substance does not support bacteria or fungal growth. How long does RetroFit Foam last? Indefinitely. As an inert, long lasting polymer, RetroFit Foam is a great insulating material for any residential or commercial structure. How long does it take for RetroFit Foam to cure? Like shaving cream, RetroFit Foam turns from liquid to foam in seconds after spraying. It quickly hardens within a minute and completely cures within a few days. Can RetroFit Foam be used to reduce noise through walls? Yes. RetroFit Foam has an STC rating of 53 in a standard wood frame 2 by 4 wall with a single layer of gypsum board on either side. Are rodents and insects a problem with RetroFit Foam insulation? No. RetroFit Foam, as an inert substance, is pest resistant. It has absolutely no food value to the pests. Also, since RetroFit Foam fills wall cavities so completely, it leaves little room for pests to get in. Does RetroFit Foam create problems with a home's electrical system? No, RetroFit Foam has been tested and is not a worry to electrical professionals. What is the New England service coverage area of RetroFit Insulation, Inc. ?